Getting a good night’s sleep is not always easy. There are just too many distractions that hinder a restful sleep. Even the type of bed can contribute to a lack of a good sleep. Did you know that you do not always need a box spring? While box springs bring a little comfort and protect your mattress. You can get the same level of performance with a simple wood bed platform. 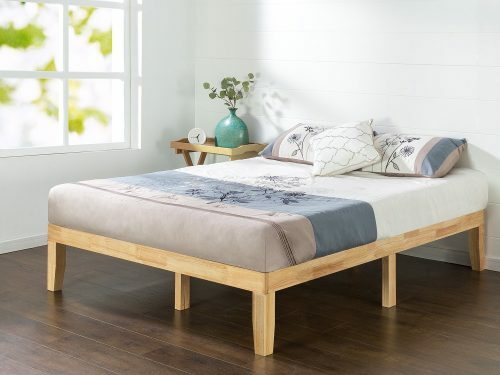 The top 12 best wood bed platforms in 2019 are stylish, inexpensive and sturdy. You won’t miss your box spring. 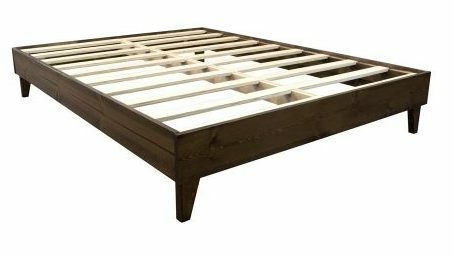 Our review will guide you to the 12 best wood bed platforms and make your buying decision a lot easier. This elegant, yet simple looking wood bed platform stand 14 inches high and provides a 3.5-inch frame for your mattress. You get an extra 3 legs to help support the 74.5 x 38 x 14-inch frame. There is no need to worry about making noise when using this wood bed platform. Foam tape has been added to make sure your night time activities are not noisy. 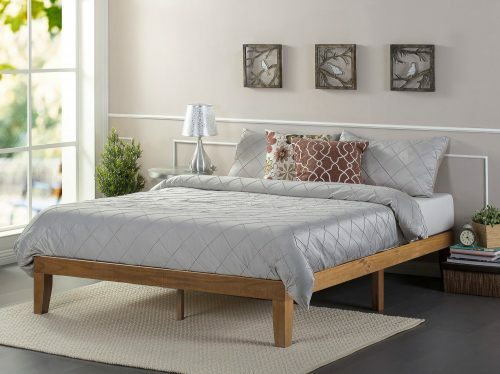 Made from solid pine and plywood this wood bed platform is guaranteed for 5 years. If you miss your box spring, this unit is designed to work with one or not. It is up to your preference. There is nothing wrong with getting a little help. While most of the bed platform is made out of wood, it does combine with a metal headboard & footboard. This provides both style and durability. The wood slats also include foam tape to keep them from moving and making noise when you use your bed. Along with these features, you get 12 inches of clearance. That distance makes for easy cleaning or storing things under the bed. The dimensions, 78 x 38.7 x 40.2 inches, include the 12-inch clearance. This bed platform is rated to hold up to 500 pounds as well. This combination of wood and metal offers a wood accent for style. It has an extra center leg for support of the wood slats. There is foam tape for no noise and non-slip tape to keep the wood slats in place. The 78.7 x 54.3 x 40.2-inch dimensions also provide you with 12 inches of clearance under the platform. Assembly is easy. Just match the numbers and use an ellen wrench to tighten together. The wood slats come pre-attached to the Velcro tape. You just roll it out and they are in place.The construction is very solid and may be a bit tight. 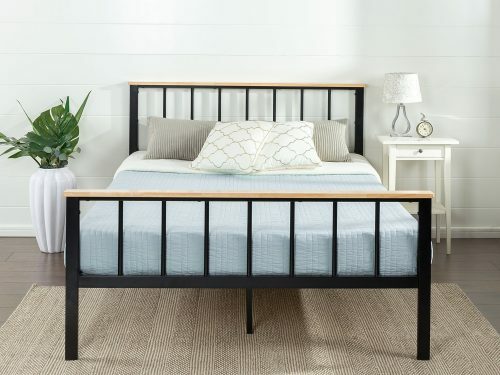 This all wood bed is easy to assemble and does not need a box spring to give you support. The dimensions of this pine frame platform measure 77.9 x 39.9 x 35.4 inches and provide roughly 8 inches of clearance. The inner dimensions are 75” L x 38.5” W and the whole unit includes the headboard and footboard. You can get a white, walnut or espresso color finish. This makes it easier to match the frame to your bedroom décor. This wood bed platform is rated to hold up to 330 pounds. That includes mattress and humans. The 12 inches mentioned indicates the clearance from the floor to the bottom of the bed. There is more than enough space to easily clean under or use as extra storage. The wood bed platform has slates for mattress support, 3 extra center legs and foam tape to block noise. When using this wood platform, there is no need for a box spring. It is also not designed to use with a headboard or footboard. The wood slats are already attached to non-slip tape. You just roll the combination out and they are ready to be put into place. This deluxe model gives you 2 extra inches in the frame. Instead of 3.75” you get 5.75”. There is very little floor to bed clearance as this deluxe model only stands 12” high. You get the usual wood slats attached to the non-slip tape. As well as the standard noise reduction foam tape. Like other similar beds, there is no need for a box spring. Also, the platform is not compatible with a foot or head boards. There are extra legs to help maintain the support for the wood slats. A 5-year warranty protects your investment. Not everyone likes the look that wood brings to a room. That is why there are upholstered options. The wood headboard and frame are covered with a dark grey fabric It is easy to assemble. All the parts are found in the unique zippered pocket sewn into the headboard. There is not much ground clearance even though the platform measures 57.1 x 79.2 x 43.1 inches. There are extra legs to support the wood slats. The standard 5-year warranty protects your platform and investment. Be careful the all the pieces way approx. 80 pounds. You will need help in moving the unit. 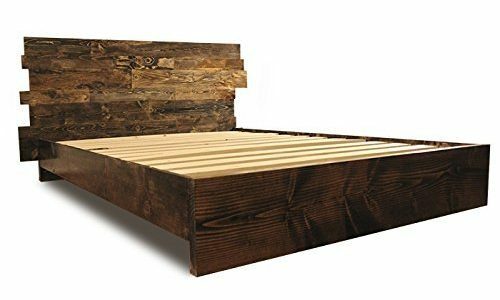 The headboard on this wood bed platform brings a bit of the old rustic west to your bedroom. The 76.7 x 38.5 x 41.5-inch unit weighs only 57 pounds, approx. and fits nicely into your bedroom. As with other products from this manufacturer, the wood bed platform comes with foam and non-slip tape. The wood slats are roughly 3 inches apart on the smaller bed options and 2,5 inches apart on the larger ones. You only get 8 inches of floor clearance, but this unit is protected by the standard 5-year warranty. It is not that difficult to assemble but you may need more than two hands to do it right. This unit comes with a lot of special features. While it is only offered in twin and full sizes, the platform has a variety of colors to choose from. There is no floor clearance. The space is already occupied with the platform’s own storage drawers. 12 slates support the mattress and the headboard and safety railing are sold separately. You do not have to buy them if you do not want them. The 76 x 42 x 15- inch platform weighs almost 90 pounds and can hold up to 300 pounds of weight. 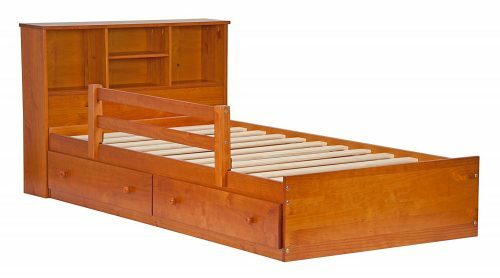 Made from 100% pine, you get 12 slats, 2 drawers and no box spring required. 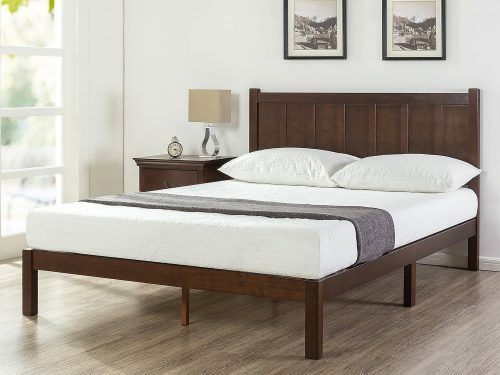 This simple wood bed platform is made in America. Made from 100% pine, including the slats, no tools are needed to assemble this unit. It should only take roughly 3 minutes to snap everything together. The 85.5″ x 73.75″ x 13.5″ wood platform only provides 6.5 inches of ground clearance. Still enough room to easily clean underneath. The slats are placed 6” apart yet they can still hold up to 900 pounds of weight. The pine is given a walnut stain to ensure that it will fit in with any bedroom décor. Not compatible with a headboard or footboard and no extra legs for support. You have heard about the quality of Amish craftsmanship. Now you can own a piece of their handiwork. Made by the Amish using solid ash, this unit measures 86″ x 74.25″ x 13.5″. There is only about 6 ½ inches of ground clearance. The wood slats are made from press poplar and are spaced 3” apart. This design allows for up to 1500 pounds of weight to be placed on the platform. Easy to assemble, the aluminum brackets simply just slide together. The headboard is optional. Get a contemporary look with this wood bed platform. Made from Douglas Fir and Sugar pine, the platform measures 83 x 44 x 61 ½ inches. Approx. a dozen wood slates support the mattress and no box spring is required. The offset headboard adds a decorative, as well as a rustic touch to your bedroom look. This handcrafted wood bed platform is not light, but it can hold its own when heavy weight is placed on it. It is also easy to assemble. 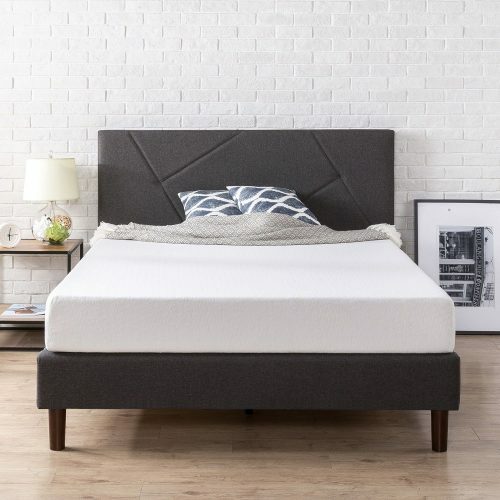 Using a box spring is the traditional way to get a good night’s sleep. These top 12 best wood bed platforms in 2108 allow you to use tradition or make your own sleep statement. There is no need for a box spring when you have good solid wood support. These uniquely designed wood bed platforms bring s sense of style to your bedroom. There is a design that is just right for you and your family. 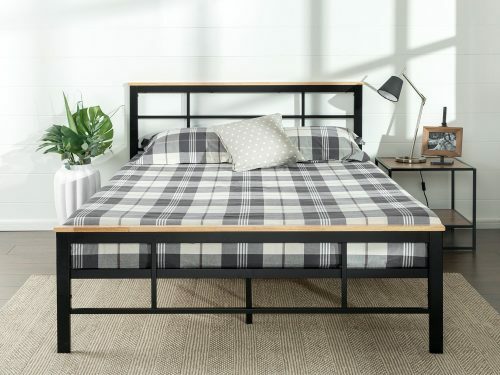 With this information, purchasing one of the top 12 best wood bed platforms in 2019 got a lot simpler.